The Penrith rugby club was immediately axed from the Shute Shield this week, without even being given the option to finish the season and then perhaps revert to another competition. A more mean spirited act could not have been more contrived, which can only reflect the total disdain win which Penrith rugby – after 27 years in the Shute Shield – is held. Rugby administration in NSW resembles the fiefdom of eras of times gone past. The Rugby AU is control of all juniors, there is the Waratah franchise. The Brumbies control southern NSW up to Liverpool. Sydney Rugby controls Sydney and somehow NSW Country overlaps and manages the rest. Six organisations managing the one asset! Collectively the combined fiefdoms comprising NSW rugby Administration have ignored Western Sydney – the biggest rugby nursery in Australia and home of Kurtley Beale! And while other codes have poured their resources in Western Sydney, Rugby AU has cried poor. Paul Culley’s dissection of the Rugby AU balance sheet has shown just how well the Rugby AU looks after itself at the expense of just about everything else. Penrith rugby existence has been one of marginalisation and no doubt travelling west of Parramatta has grated on the eastern suburb and north shore fiefdoms that control the game. The player resource pool was not under its control and was underfunded by Rugby AU. 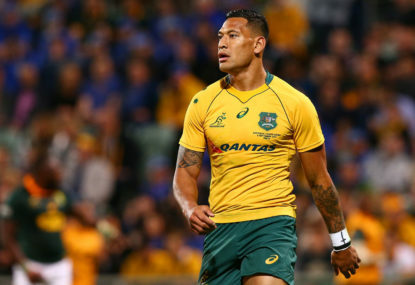 An amazing marketing opportunity was lost when Israel Folau joined the Waratahs – now Israel will never play a Shute Shield match. Just imagine the marketing benefits if Israel had aligned with Penrith (instead of with the ultimate player cherry pickers – Sydney Uni). It can only be hoped that Twiggy Forrest reads this article and establishes a Western Sydney franchise for his competition, as it is clear that those in charge of rugby right now are not interested.